From a no longer existing private house in the Malik az-Zahir quarter. Marble and colored stone, in part painted. Although inspired by the Mihrāb architecture of mosques, this is not a prayer niche. The wall niche is from the bourgeois home of Samaritans lived – a religious community related to Judaism. The Samaritan inscriptions in the groins of the arch and on the rosettes on the rear wall are quotations from the Old Testament (Genesis and Exodus). Multaka: Refugees and immigrants with Syrian or Iraqi backgrounds as mediators in 4 Berlin museums present their favorite objects. 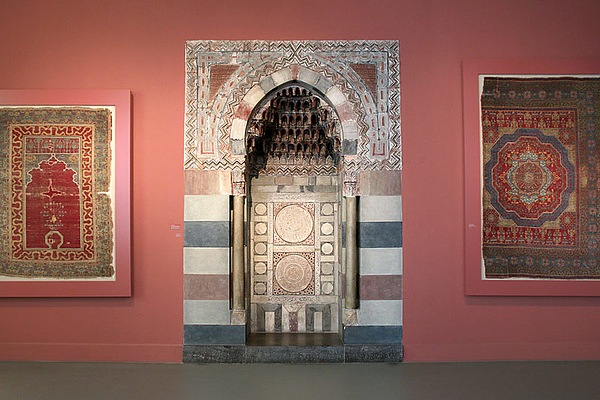 Samaritan Niche, Museum of Islamic Art.